The house lights still blazed brightly as townsfolk trickled onto the stage, clutching their bladders in agony. "When did that guy get here?" my neighbor asked, nodding in the direction of a man writhing on the stage floor. His unannounced arrival was the first indication that this musical would be filled with all things unexpected. The second clue came when Officer Lockstock, also the narrator, welcomed us to Urinetown: The Musical, flashing his best jazz hands. Yes, a musical that knows it's a musical and repeatedly reminds you it's a musical — that's also unexpected. Lockstock, played by the hilarious Rick Pendzich, goes on to relay the history of Urinetown — the fictitious place, not the 2001 Tony winner. Per the audience guide, the story is set in a "Gotham-like" city where a 20-year drought has led to the government control of all toilets. An evil corporation, Urine Good Company, regulates public bathrooms and charges people for the privilege to pee. 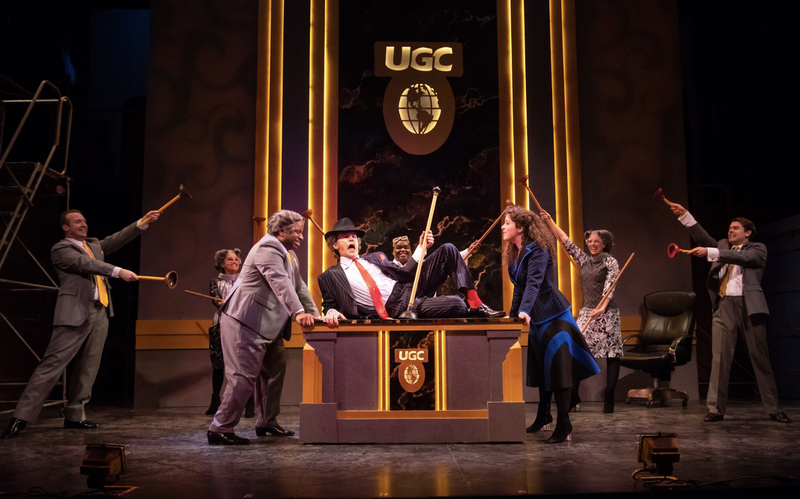 This satire touches on the class system, corporate greed, capitalism, and politics — and it's done with laugh-out-loud gags aplenty. Luckily, there's so much more than potty humor here. There's a classic boy-meets-girl romance and a root-for-the-underdog verve. Most notably, Urinetown was written by Mark Hollmann and Greg Kotis to be an ode to musical theater itself. 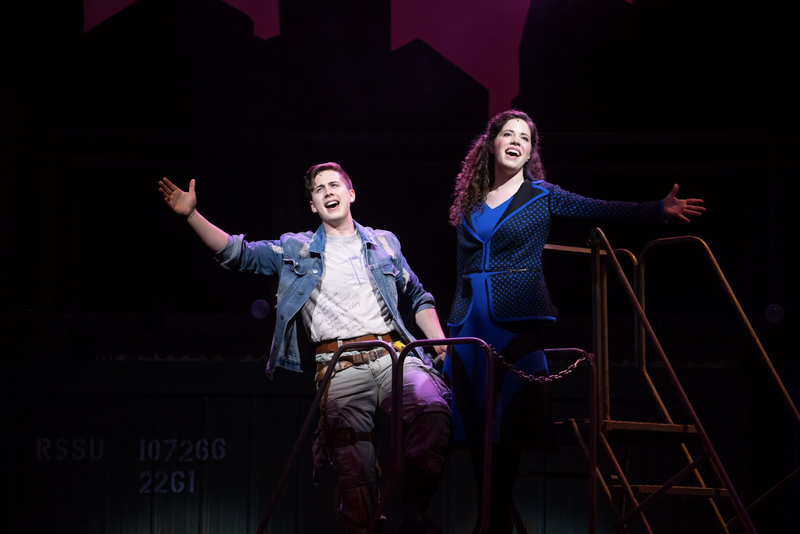 Says Skylight Artistic Director Ray Jivoff: "Once you get past the title, a source for comedy in the script, this is a really entertaining Broadway musical that reinvigorated the very notion of what a musical could be." More on that to come. Let's pivot back to the comedy. This Skylight cast has comedic timing down pat, playing up the humor in all the usual character tropes. There's our hero — the young & earnest upstart, the wide-eyed dream girl, the cartoonishly evil big wigs, cops with their film noir speech patterns, and Little Sally who innocently pesters our narrator throughout the show. Though delivered with childlike naiveté, Little Sally (Kaylee Annable) always asks the big questions. Like, why focus solely on toilets and not other issues affected by a 20-year drought, such as bathing or hydraulics. As Officer Lockstock explains, it's easier for the audience to digest just one issue — and it's easier to write. As for the other tropes, our hero is Bobby Strong, played by Lucas Pastrana, a recent grad of the Peck School of the Arts. Pastrana's voice is as mighty as his character's surname; his demeanor on point as the archetypal leading man. 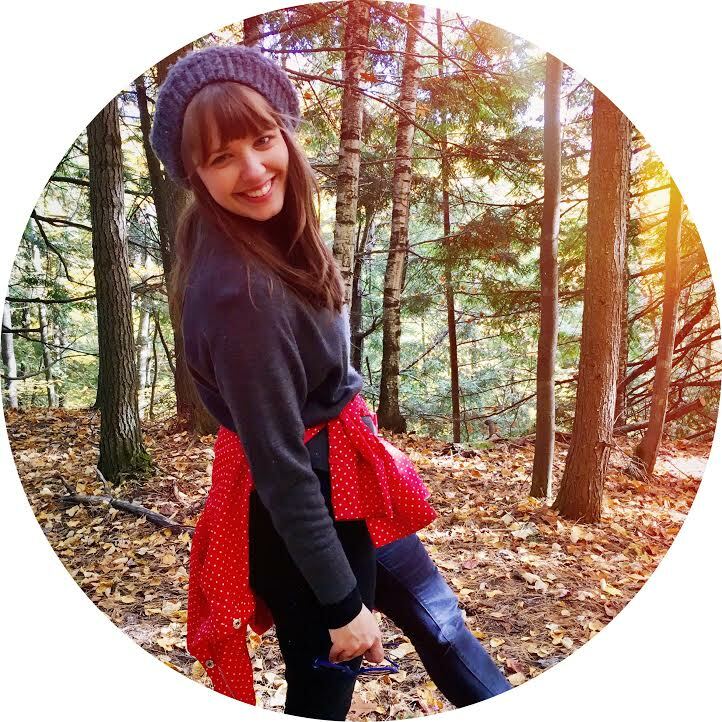 Bobby Strong's love interest, Hope, is played by Milwaukee native Rachael Zientek, who walks the fine line between sickly-sweet and knowingly-saccharine, and does so with a lovely voice to boot. These two make a delightful and funny pair. Aside from perhaps Pendzich's Officer Lockstock and Annable's Little Sally, few drew bigger laughs than the maniacal men controlling the toilets: Steven M. Koehler as head honcho Caldwell B. Cladwell, Doug Jarecki as Senator Fipp, and James Carrington as the shrieking Mr. McQueen. There's also Penelope Pennywise (Amber Smith), a pawn in the bad guys' plot to increase the fee to pee. Pennywise controls Public Amenity #9 — the toilet used by Bobby Strong and his band of revolutionaries. Smith's Pennywise doesn't skip a beat, her voice commanding through her character's palpable sleaze. 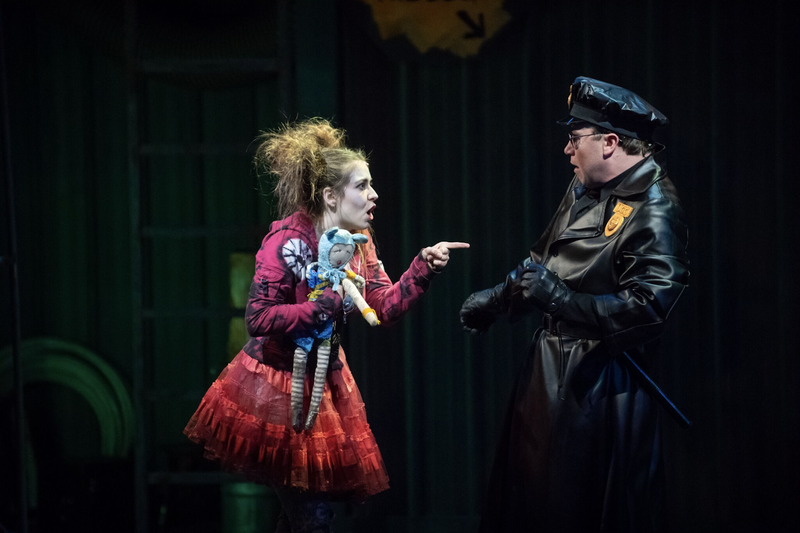 The Skylight has also assembled a dynamite ensemble cast, with each voice a force and each character an asset to Urinetown's side-splitting humor. 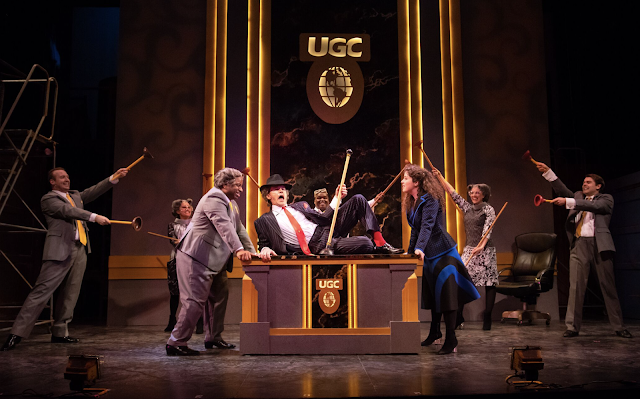 The ensemble does a lot of the heavy lifting in bringing the aforementioned musical odes to life — from mimicking a chorus of plunger-toting Ziegfeld girls to marching à la Les Miserables to attempting the famous Fiddler bottle dance with (again) plungers in place of bottles. Beyond the laughs, one of the biggest show-stoppers is Act Two's "Run, Freedom, Run!" — a gospel-inspired tune with an acapella break that showcases just how stunningly talented this entire cast is. In the end, you may leave Urinetown wondering, as Little Sally does, what kind of a musical is this? Officer Lockstock would have me remind me you that it isn't supposed to be a happy one. It's one full of mixed signals: comedic tropes, untimely death, catchy music, rich vs. poor, hope for tomorrow, and an ultimately uncertain future. It makes you think not only about the baddies who want to regulate our metaphorical toilets, but also the do-gooders who act on righteous principle alone without regard to reality. 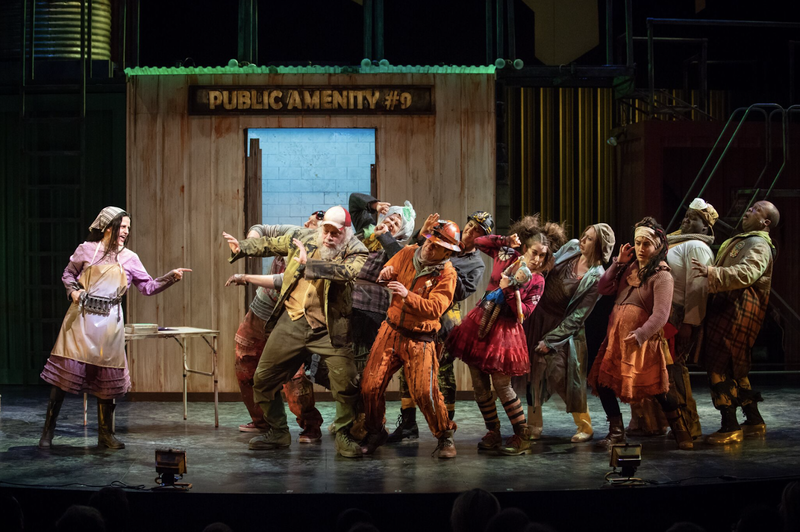 As show creator Mark Hollmann says, "No one has the answer; Urinetown merely raises the questions." The one thing you won't be questioning as you leave the Skylight is whether or not this was two hours of your time well spent. For that, the answer would be a hearty yes. Just make sure to exercise your right to pee before all the laughing kicks in. 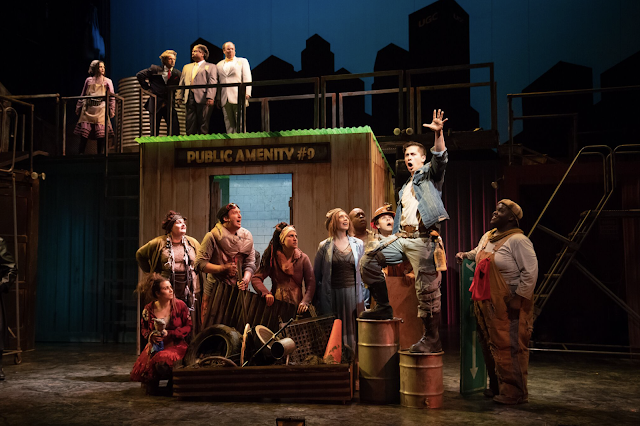 Urinetown is playing at the Skylight Music Theatre, now through June 10th. Info and tickets at skylightmusictheatre.org. People get really into Derby Day. They're so into it, I have a sneaking suspicion it's becoming just another excuse for the masses to get drunk and wear lavish headwear they normally wouldn't dare to don. Who am I kidding? That's more so a fact than a suspicion. But that doesn't mean my first-ever Derby party (don't knock it 'til you try it, amiright?) wasn't super fun — it was actually a blast. This was Maxie's 11th year hosting their Derby party, which apparently grows a little bit bigger each year. Admission is $15, benefitting the Hunger Task Force. There's a big white tent in the lot beside the restaurant and a big brass band playing swing-y classics. Be sure to pop inside the restaurant for a quick shot of A.C. on a hot day. There you can also enter your raffle tickets ($1 each) for the prize(s) of your choosing. I went for a Good Kind gift card and cheese board paraphernalia, but left empty handed. In addition to raffles, picking which horse will win, place, or show is certainly a must. It makes the two-minute race itself worthwhile. As for outfits, there are prizes for the best hats and costumes. Colonel Sanders was an obvious pick for Best Costume this year, and a pair of adorable jockeys easily snagged Best-Dressed Couple. Food & drink-wise, note: The cocktails are super sweet. I switched to beer after puckering my way through one mint julep. However, though overly doused in simple syrup, I will say it was also stacked with bourbon. Do with the info what you will — I'll be the one drinking beer next year, and making sure to hydrate. The food was standard Maxie's fare: mac 'n' cheese, chicken tenders, house-made chips, ribs, and more. Plenty tasty! But my favorite thing about Derby Day at Maxie's was the people watching. Sometimes folks just like an excuse to put on their Sunday best and be a little bit fabulous. Though I can't confirm firsthand, I've heard that other parties, like the one at the Iron Horse Hotel, can turn into a mess of day-drinkers who are one spiked sweet tea away from vomiting all over your dress shoes. Maxie's Derby Day, on the other hand, was utterly welcoming to people of all ages. Watching grandmas get down to blaring trumpets while little ones practice their breakdancing — it's such fun! Shall we do it again? You can bet on it. See you next May! My parents, brother Kevin, and I have been going to Naples, Florida, for as long as I can remember. There are pictures of me as a baby taking a bath in the sink at my grandma's condo. We celebrated my grandparents' 50th anniversary with the extended family there, when I was about nine. All six of my dad's brothers, his one sister, all of their spouses, and all of my cousins — they were all there. I remember the plastic alligator that sat in the courtyard of my grandma's condo building — you could see it every time you got on the elevator from the lobby. "Is it really real?" we kids would ask, ever skeptical. My dad insisted it was, even though it never budged from its spot, year after year. We eventually got wise. Every day of Naples vacation, we'd walk down to the boardwalk that stood between Grandma and Grandpa's high-rise and the Gulf. In those days, it felt like an excruciating distance. If we were lucky, Dad would let us hop on a passing tram — but he and my mom preferred the walk. Easy for them, but tough on little legs. Kevin and I now laugh at how un-epic the walk from the Stratford condo to the beach is. These days, it's my dad's aforementioned "one sister" — my only blood-relative aunt on the Lawler side — who now occupies my grandparents' former condo. It's been a handful of years now since they left this world for that big, beautiful boardwalk in the sky. 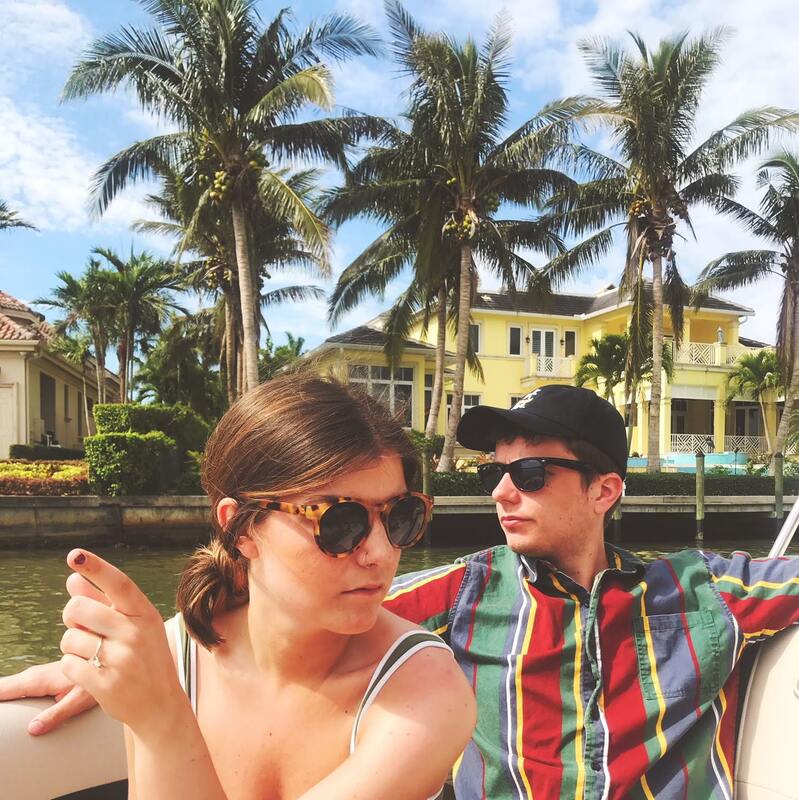 Shoutout to my aunt for keeping the Naples tradition alive and letting our family of four — plus Kevin's fiancé, Erin — stay for a week this April. 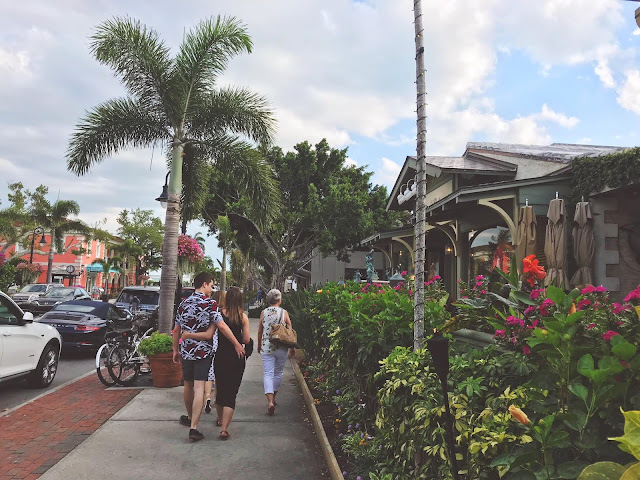 Below are some thoughts and notes-to-self for making a Naples family vacation worth your while. First off, recognize that Naples is largely well-to-do retirees. This means a lack of youth culture, limited nightlife, and drivers who are allegedly either drunk or asleep at the wheel by mid-afternoon. You can never be too careful when cruising through Pelican Bay. Due to its demographic, the bulk of what one does in Naples is beach, eat, nap, eat, pool, and eat. If it's shopping you crave, know that you're probably not going to buy anything — not the $200 chambray shirtdress and not the $400 yellow mule sandals. Since all you're doing is browsing, browse downtown, rather than at a mall. Scope out 5th Avenue, 12th Street, and 3rd Avenue; it's cute even if you leave empty-handed. Activity-wise, we made the best of it. On Friday morning, my mom, Erin, and I accompanied my aunt to the condo pool for water aerobics — an unforgettable hour of shakin' what mama gave us with a bunch of darling oldies. If that's not quintessential Naples, I don't know what is. We also borrowed bikes and rode the path along the boardwalk one morning. Next time, a sunset bike trip would be even more picturesque, given the golden hour. We also spent a day on a boat, meandering the inland waterways until we reached Marco Island and our lunch destination, Snook Inn. This was actually one of our favorite spots we ate at. It's cazh, has a giant patio on the water with ample umbrellas for shade, and serves up scrumptious grouper sandwiches (get it fried!) and iced lemonade. Note to self: On our way to the island, we passed many boats camped out along small beaches. In the future, it would be fun to work some beach time into the boat day. On our final morning in Naples, some of us rented tandem kayaks to paddle the mangroves. It was a fun time, even if the view offers a lot of the same. We did see some birds, but nothing more impressive than that — not like the family of otters we saw while biking or the dolphins we spied during boat day. The act of renting the kayaks was also a bit of a hassle. But would we do it again? Why not! Probably one of our favorite mornings was spent at the Botanical Garden, where most of these photos were taken. 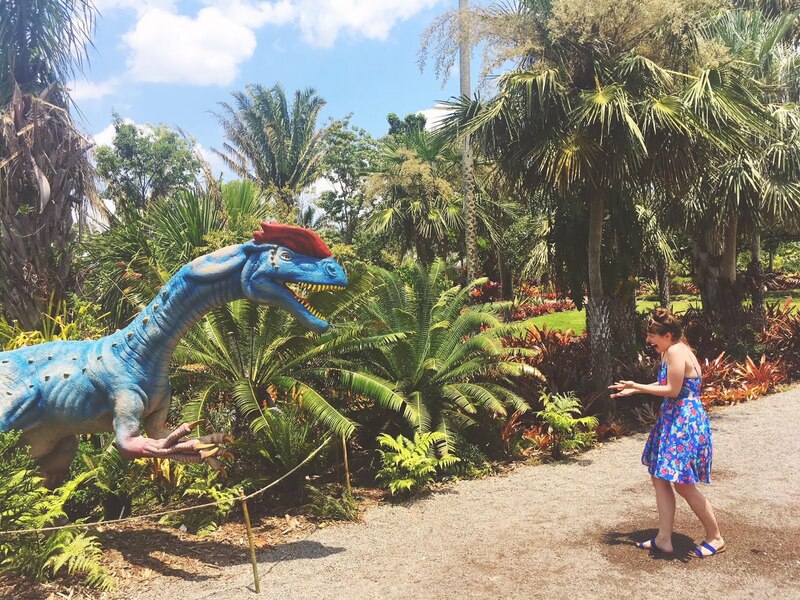 It was Kevin's birthday, and they happened to have a dino exhibit — his favorite. 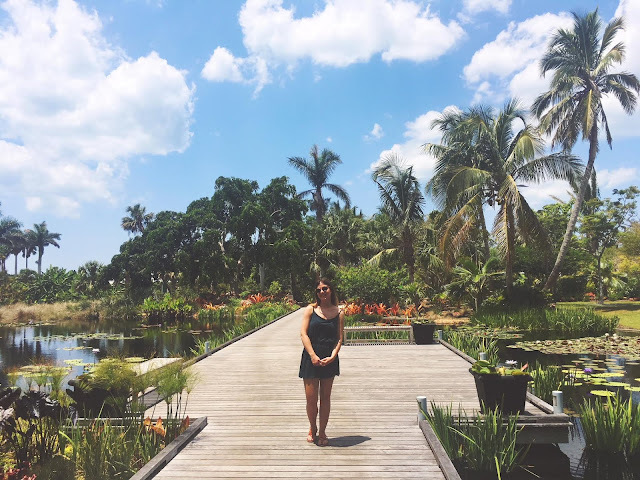 The gardens are gorgeous and lush — absolutely worth the trip. Just bear in mind that it can get scorching around midday, however, there is a café in the gardens, if you're craving shade and sustenance. Speaking of eating! I already mentioned Snook Inn, which was our favorite casual spot. 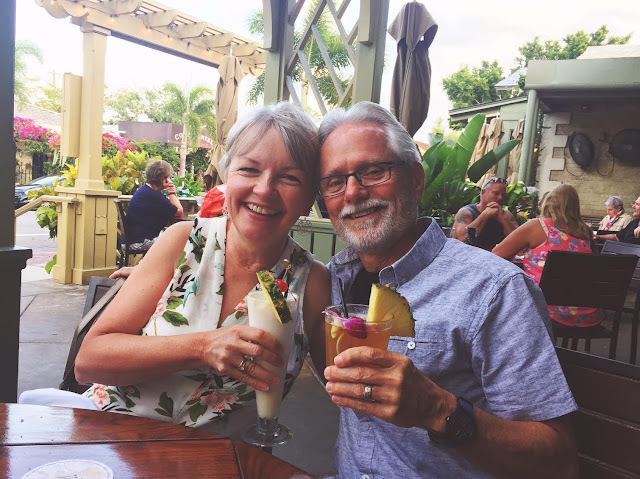 Our favorite fancier spot was Tommy Bahama. Yes it's a chain, but Naples boasts the original, and the experience really is a treat. The live music was on point. Our waiter was such a delight and made us feel like every dining decision we made, from the drinks we ordered to our entrée picks, was the right one. The cocktails are a must. Loved the pina colada and flavored margaritas. The house marg tastes like any house marg, so spring for something special. For dinner, about half of us got the macadamia-crusted snapper and half got the signature chicken. The snapper was delish, but I'd pick the chicken next time. Trust me. As for nightlife, Kevin, Erin, and I attempted to find some at the Sunset Beach Bar. My guess is that it's a fun place to hang if it's earlier in the evening — say, around actual sunset. But later (like, after 9pm), there were hardly any people there and the drinks were just so-so. 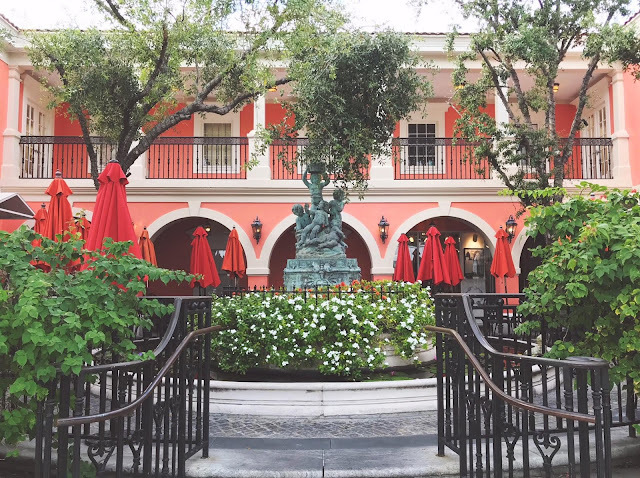 If you're going out after your elders hit the hay, I say check out a spot in downtown Naples. Not sure exactly where, but it'd be worth a peek, rather than growing increasingly tired in a low-energy beachside bar. At the end of the day, nobody goes to Naples for the wild and crazy nights, though. 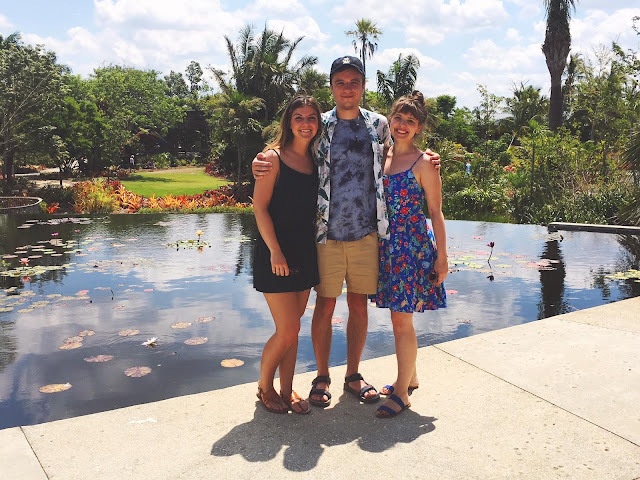 They go for sunny days spent with family — and sometimes that's all you need.